Paris (AFP) - Floral nectar contains a bouquet of natural chemicals that may help fight parasite infection in bumble bees, a study said Wednesday. The findings throw up clues for helping honey bee colonies battling mysterious but catastrophic decline. Biologists in New England tested eight nectar compounds on North American bumble bees -- Latin name Bombus impatiens -- that had been infected in the lab with an intestinal parasite called Crithidia bombi. Four of the eight were effective against Crithidia, which is spread by bee faeces and lowers winter survival rates and reproductive success. The most impressive impact came from an alkaloid called anabasine, found in a species of wild tobacco called Nicotiana glauca, which reduced the parasites by 81 percent. It was followed by thymol (67 percent) found in the common lime tree (Tilia europaea), nicotine (62 percent), also found in tobacco, and catalpol, found in a North American plant called white turtlehead (Chelone glabra), with 61 percent. "The results suggest that growing plants high in these compounds around farm fields could create a natural 'medicine cabinet' that improves survival of diseased bees and pollination of crops," Dartmouth College in New Hampshire said in a statement. Further experiments will show whether the compounds also benefit honey bees, which have been hit in North America and Europe by a phenomenon called colony collapse disorder, said Leif Richardson, who headed the study. Parasites have been fingered, but insecticides and intensive monoculture, which destroys the bees' habitat, have also been cited as possible causes. "Bumble bees and honey bees are both in the family Apidae and are relatively closely related, so it is possible that these results will also be found for honey bees," Richardson told AFP by email. The chemicals, called secondary metabolites, are also found in plant leaves as a defence against herbivores. But, in the nectar, they help to attract bees, which in turn pollinate the plant. One of the anti-Crithidia compounds that was found to be highly effective in bumble bees -- thymol -- is currently used as an organic control on mites among honey bees. "The mites are ecto-parasites and not closely related to the parasite we studied, but I find this connection interesting nonetheless," said Richardson. An important goal, he said, would be to identify wild flowers that are known to combine pollen and nectar with the precious anti-parasite compounds. "We do not yet know what plants would figure in such a recommendation and more research is needed." According to the Food and Agricultural Organisation (FAO), pollinators contribute to the yield of at least 70 percent of the major food crops for humans. The economic value of pollination was estimated at 153 billion euros ($174 billion) in 2005. 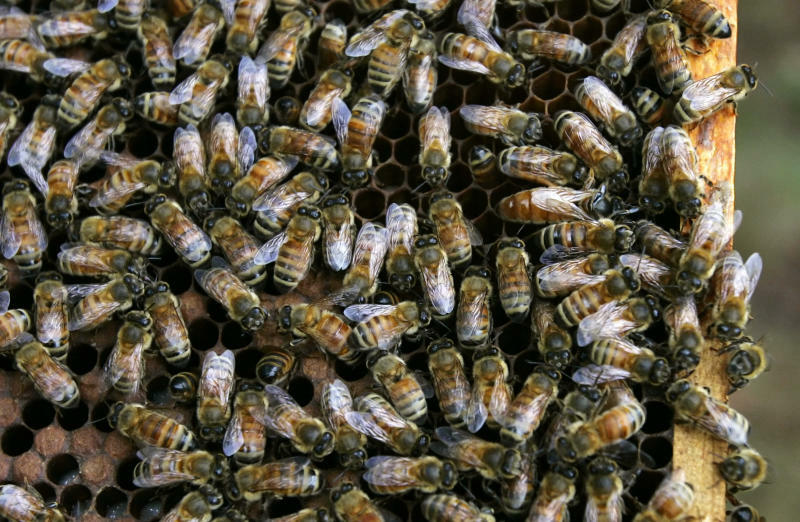 Bees, mainly bumble bees, account for some 80 percent of pollination by insects, the FAO says. The study appears in the British scientific journal Proceedings of the Royal Society B.